Natsuki Tamura Quartet - "Hada Hada" / Satoko Fujii Quartet - "Minerva" / "Zephyros"
Natsuki Tamura and Satoko Fujii are new to me and these are impressive introductions indeed. Tamura is a trumpet player who has studied at the Berklee College of Music and New England Conservatory Of Music, and has taught at the Yamaha Popular Music School in Japan. 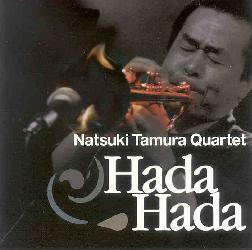 The quartet on Hada Hada consists of Tamura on trumpet, Takayuki Kato on guitar, Satoko Fujii (who is also Tamura's wife) on synthesizer and Takaaki Masuko on drums. According to the promo sheet Hada Hada is a departure for Tamura from his previous acoustic free jazz style, which is interesting to note given the sheer power of this album. The band come roaring out of the starting gate with the title track which opens with a rockin and highly intense trumpet and synth assault, with Masuko's drums laying down authoritative rhythmic blasts. Tamura blurs the lines between jazz and rock with a thick wall of passionate aggression. Imagine Coltrane or electric Miles meets Naked City and you might get something like this. "Incident" is next and creates a dark and somewhat sinister mood, with screeching guitar manipulations, wailing spacey phantom of the opera synth lines and pounding drums, only offset by the more sedate and melodic trumpet. And a couple tracks into this CD I'm catching on to the critical role played by Masuko, whose creative drumming adds so much of the character and narrative feel of the music. Other highlights include "Kagero", which seems more focused on creating mood and atmosphere, but is by no means lacking in aggression and the free-wheeling avant-garde aesthetic that characterizes so much of the album. I dig the cool spacey synths within a heavy rocking free-improv context on "Mizore". The entire band shines on the whimsical but hair raisingly potent "Explorer". "Sateto" is even more purely atmospheric, being a very nice melding of space-ambience and Tamura's brand of avant rockin free-jazz. And "Utage" adds symphonics to the mix and also features some of Kato's most prominent guitar work of the set. Overall I have to say WOW! HIGHEST recommendation on this one. If you want to hear aggressive avant-rock played by free-jazz musicians this sucker takes the cake. Also interesting to note on Hada Hada was that this was the first recording to feature Satoko Fujii on synthesizer, her primary instrument being piano. 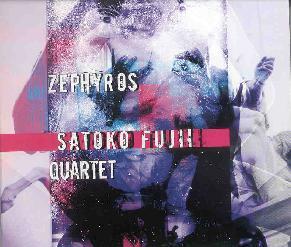 On both Satoko Fujii albums the quartet consists of Fujii on piano, Natsuki Tamura on trumpet, Takeharu Hayakawa on bass and Tatsuya Yoshida of Ruins on drums and voice. Minerva opens with "Tatsu Take", which features Tamura's trumpet in a more traditional jazz style than anything we heard on Hada Hada. Ditto for Fujii's piano, though there is little that is traditional about the music. Fujii's music is nowhere near Hada Hada in terms of aggression, but the music is a pleasure ride that takes numerous thematic twists and turns and features excellent playing from both piano and trumpet. And while the music is based in jazz, the rhythm section add a definite rock edge. Hayakawa's bass has a very deep, chest pounding sound... almost zheul-ish like he were playing with Magma. "Warp" begins very slowly and subtly with an abstract free-improv and sound manipulation intro. Then the trumpet plays a dreamy jazz melody which soon evolves into cool smokey lounge free-jazz jam, once again given a rock edge by the bass, and ultimately exploding into a full band jam. Fujii's piano is exquisite, with some of her most emotionally intense playing of the set. The bass reminds me of that throbbing old Bill Laswell sound where each note was like an electric current spinning in your cranium. Parts of this made me wonder what Dr Nerve might sound like with piano as a central instrument. "Weft" is one of the more mainstream jazz pieces of the set. The band settle into a beautiful rolling jazz groove that builds on it's central theme, but is colored and kept interesting throughout by little avant-garde bits. "Caught In A Web" closes the set and returns to more adventurous territory, with a cool blend of free-jazz, abstract free-improv, and moody atmospherics. Lots of turn-on-a-dime diversity, from ambience to intense rockin explosions. The last minute of the piece feature THE most fiery rockin music on the album, with Hayakawa's bass surprisingly going into fuzzed out freakout mode. Quite a finale to a varied and often exciting album. 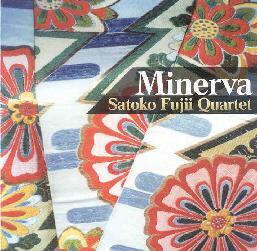 Fujii's latest, Zephyros, features the same quartet from Minerva, though this latest effort reveals the influence of Rock being more deeply explored. "The Future Is The Past" opens in a more avant-progressive rock style than the music heard on Minerva. Jazz still forms the basis of the music though the power and intensity of Magma and the dark chamber ensemble feel of Univers Zero are also part of the stew, as well as the free-jazz stylings that are so characteristic of Fujii's compositions. "15 Minutes To Get To The Station" is similar and includes some of the most ripping performances and compositional acrobats of the set. Awesome! "As Usual" disarms the listener by starting out with easy paced jazz, but soon launches into a smoking jam. You think piano and trumpet can't ROCK? Check this out. Complex constructions that blaze red hot trails. Often it's the rhythm section that propels the music into the Rock realm as evidenced by the killer bass and drumming on "Flying To The South". But the track is also firmly in the jazz realm and features stunning performances from Tamura and Fujii. "First Tango" and "Summer Day" are yet more cool tunes that journey along the murky ground between jazz and avant-rock. "Clear Sky--For Christopher" features an interesting blend of intensity and cabaret-like whimsy. In summary, I can wholeheartedly recommend both of Fujii's CD's... but start with Zephyros. For more information you can visit the Libra Records web site at: http://www2s.biglobe.ne.jp/~Libra.